Have you ever been treated unfairly because of your age, the color of your skin, or where you live? 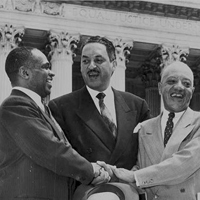 Thurgood Marshall worked all of his life to make sure all people were treated fairly, especially under the law. Thurgood Marshall had a noteworthy first name, but it fit him well because he was a noteworthy person. On October 2, 1967, he became the first African-American Supreme Court justice. Of course, Marshall had accomplished plenty of other things before then.